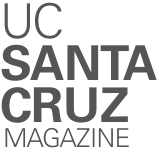 UC Santa Cruz is taking a cutting-edge approach when it comes to engaging with alumni, replacing its traditional alumni association model with a bold new networking model. The campus began moving toward a more innovative alumni engagement strategy in the fall of 2014 when its Alumni Council unanimously voted to adopt an inclusive, dues-free system to replace the former Alumni Association dues model. At the time of the vote, the UC Santa Cruz Alumni Association consisted of 9,000 dues-paying members. With this gesture, the Alumni Council did much more than just change the structure of the alumni group; they expanded its size more than tenfold. At 50 years old, UC Santa Cruz has amassed an impressive 100,000 Banana Slug alumni. Now, the moment students graduate from UC Santa Cruz, they automatically gain admission into that alumni network. In other words, the alumni network comes to them. There are no thresholds for membership and no dues, and therefore no need for Slugs to worry about whether or not they can afford to be part of this connected group. All alumni receive the same services offered by their alumni network. The Alumni Council’s research revealed that alumni are very interested in career connections. As one of the first services offered, members will be able to tap into a web of potential mentors, job connections, internships, externships, and real-world learning experiences. “I have worked in higher education most of my life, so I am very aware of the difficult transition between graduation and career for students,” said Mekis, who worked in developing and directing community college transfer programs at both UC Santa Cruz and Cabrillo College for 30 years. To address this situation, UC Santa Cruz has built an online portal called the Career Advice Network (ucsc.edu/can), allowing alumni to offer career advice to students and other alumni. Whether they are interested in pursuing law, medicine, or a career in the arts, the portal is there to connect them. Other offerings for members are in development. This free membership concept appears to be spreading, with UCLA, UC San Diego, Ohio State University, and the University of South Florida, among many others, also embracing this model. One challenge of changing the membership structure is getting the word out and building a comprehensive alumni base. Another challenge is reaching out to the full alumni group. It’s easier to reach all those people while they are still on campus—which is why supporters of the alumni network hope to nurture a strong spirit of student philanthropy. Charles Eadie, past president of the Alumni Council, is excited about the changes. The UC Santa Cruz community is for life—once a Slug, always a Slug. Visit alumni.ucsc.edu for more information. Alumna Azwa Salleh (Porter ’08) got a job through her UC Santa Cruz connection. 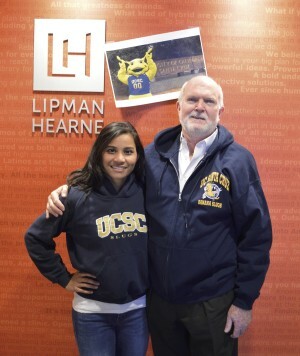 She saw that the CEO of Chicago marketing and communications agency Lipman Hearne—Rob Moore (Stevenson ’70)—was a fellow alum, did some research, and sent a cold email. He responded right away, surprised to see a Banana Slug in Chicago. That’s the power of a network. Thanks so much for eliminating the dues. I could never afford them although I would have paid them if I could have. I wanted the library privlidges.